The Metolius Safe Tech Comp is a great harness for safety conscious climbers who want extra security. With the Safe Tech features and a secure waist belt, this lightweight and compact harness offers climbers additional piece of mind. 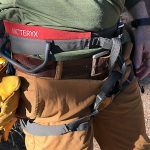 The Metolius Safe Tech Comp is the lightest and most compact harness in the Safe Tech harness line. All of the harnesses feature components are considered full strength, with the lowest rating of any component (the elastic) coming in at 6.6 kN. The Comp is designed to prevent accidents; from accidentally clipping a belay device into a gear loop or improperly threading a waist buckle. The Safe Tech Comp’s comfort comes from its flexibility and freedom of movement. The Comp is a light harness with slim padding and narrow construction. It lacks the plus padding of other harnesses and in testing, sometimes proved to be uncomfortable. 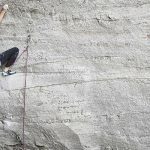 It is best suited for single pitch and gym climbing where your time is spent grabbing the rock but is not ideal in multi-pitch scenarios, where you may be hanging at a belay for an hour or more. While the Comp lacks the hanging comfort of many other harnesses tested, it climbs with great comfort and freedom of movement. The Comp is the only Metolius harness in the Safe Tech line to incorporate a unique, sliding speed buckle. The Comp’s speed buckle (rated 10 kN) holds tight, and in testing we didn’t experience any slipping (despite repeated efforts). The downside to the Comp’s speed buckle is its difficulty adjusting. Unlike other speed buckles (where you can pull on the nylon and get a snug fit around your waist), the Comp forces you to pull nylon through the buckle (similar to traditional double backed buckles). While challenging at first, after watching Metolius’ instructional video and giving it some practice, I got used to it and enjoyed its tight hold. However, it can still be a challenge to get a super snug fit. The Safe Tech Comp features four gear loops that make gear accessible by rigid, plastic tubing that surrounds the nylon. The front loops stick out prominently from the harness, making it easy to clip and unclip gear. The rear gear loops lay flat, aiding in comfort when carrying a pack. All of the loops are on the small side and because they lack the contoured shape of some harness loops, gear tends to collect at the bottom. The best feature of the gear loops is their 9 kN rating—that’s 2000 lbf per loop. The leg loops on the Safe Tech Comp are narrow and thin, resulting in a lightweight and compact harness. Because the Comp uses elastic to pull the leg loops around the thighs, it lacks the comfort of other harnesses during extended hang sessions. Many other harnesses have a mechanism to adjust fit without full strength buckles, but the Comp lacks this feature. In testing, the leg loops felt unusually large for a medium sized harness (despite my large thighs), which may have also contributed to the lack of comfort. However, the leg loops do allow for great movement and flexibility while climbing. At 368 grams (13 oz), the Safe Tech Comp is on the lighter side of harnesses. It is comparable in weight to the Black Diamond Momentum and Petzl Sama but is a far cry from the featherweight Petzl Hirundos (9.9 oz). The features that stands out for many climbers looking at the SafeTech Comp is the additional safety in having every part of the harness rated to full strength. It’s common to see new climbers fumble around with things as they learn new skills and regularly I see them do things like attach their belay device to their gear loops or clip to an anchor withy quickdraws on those low strength gear loops. On a typical harness that is a bad, potentially deadly scenario but with the SafeTech Comp you can have the reassurance of knowing those gear loops are rated to 9 kN, although it doesn’t mean you should be doing any of the aforementioned bad scenarios. Another feature to note is a small haul loop that is rated to 9 kN but testers found it small and hard to clip.